Twenty years ago, only 12% of U.S. adults got news online. Today, that number stands at 81%. About six-in-ten (62%) get news through social media – a figure that rises to 84% for 18- to 29-year-olds. We have also reached a point where a large majority of the public (72%) gets news on a mobile device. As consumers have changed the ways they access news, they also have new ways to interact with it – and new sources to inform them. How have these influences shaped the American public’s habits and attitudes toward the news? A new Pew Research Center study explores the defining traits of the modern news consumer. One overarching conclusion is that news remains an important part of public life. More than seven-in-ten U.S. adults follow national and local news somewhat or very closely, and 65% follow international news with the same regularity. Overall our findings show a public that is cautious as it moves into today’s more complex news environment and discerning in its evaluation of available news sources. It also reinforces how, despite the dramatic changes witnessed in the last decade, digital news is still very much in its adolescence. Here are five key findings on today’s news consumers. 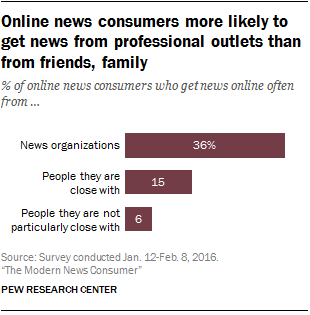 1 Friends and family are an important source of news, but Americans still count more on news organizations. Online news consumers are about twice as likely to often get news online from news organizations as they are from friends and family, and they find that news somewhat more accurate and just as near to their interests. Beyond just online news, Americans place as much trust in the information they get from news organizations as they do in information coming from family and friends – though there is a not a lot of trust placed in either. 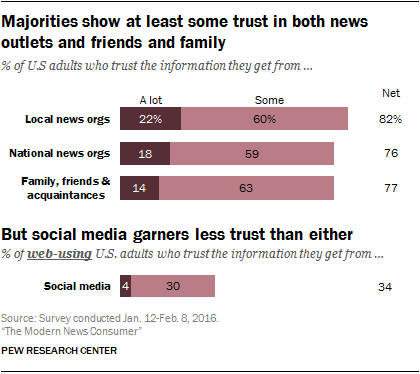 Only about two-in-ten trust information from local or national news organizations “a lot,” and 14% say the same of information from family and friends. At least three-quarters express some or a lot of trust in the information from each. 2 Americans express much more caution about news coming through social media. Although 62% of adults get news on these platforms, just 4% of web-using adults trust the information they get there a lot, and 30% trust it some. This wariness could be tied to the clear distinction the public draws between news they get online from people they are close with and those they are not: News from people they are not close with receives much lower marks for accuracy and relevance. 3The public’s sense of loyalty to their news sources is more complicated to discern. U.S. adults are almost evenly split (51% to 48%) over whether they feel loyal or not to the sources they get their news from. Nonetheless, a separate question reveals that the vast majority of Americans (76%) report turning to the same sources over and over again anyway, suggesting that convenience may trump allegiance. 4 A clear challenge for the news media is the deeply rooted sense of bias the public perceives in their reporting. Even as three-quarters of the public gives credit to news organizations for holding our leaders accountable, about the same share (74%) feels the news media favor one side in their reporting. 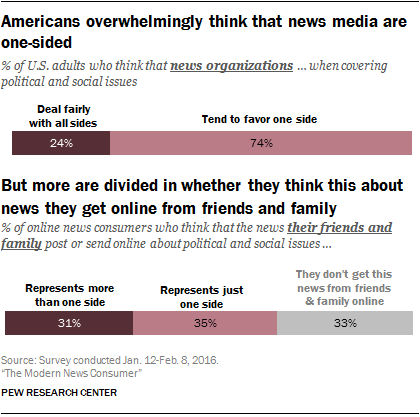 That far outpaces the portion of online news consumers who sense this about online news they get from friends and family: In that case, just about a third (35%) describe it as mostly one-sided, while 31% say it represents more than one side. Another third say they don’t get news from friends and family. 5Despite the rise of digital platforms as a source, Americans are not fully centered on the web for news. Television still commands the largest portion of the population – 57% get news there often compared with 38% who often get news online. Newspapers lag far behind at 20%. What lies behind these numbers speaks to the relationship between the web and print media. U.S. adults who prefer to watch their news still choose to do so on television, while those who prefer to read their news have mostly migrated to the web. The vast majority of U.S. adults (80%) who prefer to watch their news name TV as their preferred platform. On the other hand, most (59%) of those who prefer to read their news opt to do so on the web, while just 26% opt for printed paper. Even those who prefer to listen to news are still largely opting for the radio.